Authorities say a wildfire that overtook several Northern California towns destroyed more than 400 homes and businesses, and also burned up to 1,000 structures. California Department of Forestry and Fire Protection spokesman Daniel Berlant says those structures include barns, sheds and other outbuildings. Authorities say a wildfire that overtook several Northern California towns has killed at least one person and destroyed more than 400 homes and businesses. A California Department of Forestry and Fire Protection spokeswoman released the tally Sunday evening as firefighters continue to battle the out-of-control blaze north of San Francisco in Lake County. Lynn Valentine said officials confirmed one fatality, though she had no immediate information on the deceased. She said the fire has destroyed 400 homes, two apartment complexes and 10 businesses. Most of the destruction occurred in the communities of Middletown and Hidden Valley Lake, as well as homes along a shuttered highway. The fire broke out Saturday afternoon and exploded in size within hours. It has burned 78 square miles. Authorities say an air tanker loaded with fire retardant was forced to make an emergency landing shortly after taking off from Fresno’s airport when an engine malfunctioned. Fresno police Lt. Mike Doyle says debris from the fixed-wing Erickson Aero Tanker jet fell and shattered the rear window of a parked car Sunday afternoon. He said the small pieces of metal appear to be part of an engine casing. No one the ground was hurt and the plane landed safely. The pilots told Doyle they were fighting the massive Rough Fire east of Fresno. It is the largest wildfire in the state after burning 203 square miles of forest land. A fire that broke out near the town of Coarsegold in the Sierra foothills has prompted a mandatory evacuation order. A California Department of Forestry and Fire Protection spokesman says the fire began around 3:40 p.m. Saturday and has torched at least 10 acres. The Madera County Sheriff’s office evacuated an unknown number of residents along a rural road near State Route 41. Coarsegold, which is home to approximately 1,840 people, is located on the route from Fresno to Yosemite National Park. Fire officials say a blaze that has destroyed more than 100 homes north of San Francisco has grown to 78 square miles. Cal Fire said Sunday 1,000 firefighters are fighting the fire in Lake County, but have not been able to contain it since it began Saturday afternoon. California’s emergency chief says this summer’s fires are the most volatile he has seen in 30 years of emergency response work. Mark Ghilarducci is the director of the Governor’s Office of Emergency Services. He says the main cause behind the fast-spreading fires is dry conditions from the four-year drought. The Sacramento Bee reports (http://bit.ly/1gjVXdT ) Ghilarducci spoke Sunday after a briefing with fire and emergency officials in Calaveras County, where a fire has destroyed more than 80 homes. He says fire and emergency services operations are “stretched” and that California has asked for help from Nevada, Oregon, Utah, Colorado and Washington states. He says Nevada has already sent fire crews and aircraft. California Department of Forestry and Fire Protection spokeswoman Daniel Berlant says more than 100 homes were destroyed by a wildfire that exploded in size within hours. The fire on Sunday prompted Gov. Jerry Brown to issue a state of emergency for Lake and Napa counties. Berlant says wind gusts that reached up to 30 miles-per-hour sent embers raining down on homes. He says there’s no official count yet because firefighters are focused on new evacuation orders and the safety of residents. Berlant added that no deaths have been reported. Four fighters were injured Saturday. New mandatory evacuations have been ordered for communities near a blaze that has heavily damaged several Lake County towns. The California Department of Forestry and Fire Protection says people were ordered to evacuate Clear Lake Riviera, an area of about 3,000 residents. The blaze with zero containment raced through several towns overnight after exploding in size within hours. An Associated Press photographer reported seeing dozens of homes destroyed and a roughly 40-unit apartment complex burned to the ground. Cal Fire also says at least 5,000 people are without power. Several residents in Middletown say they also have no running water. Residents streaming from a Northern California town in the path of an explosive wildfire say the blaze has heavily damaged Middletown. George Escalona said his home has burned and he’s left with nothing but the clothes he was wearing when he fled. California fire officials are correcting the number of homes destroyed by a wildfire burning 70 miles southeast of Sacramento. California Department of Forestry and Fire Protection spokeswoman Lynn Tolmachoff says at least 81 homes and 51 outbuildings have been destroyed by a fire burning in Amador and Calaveras counties. Officials had earlier counted 86 homes destroyed, but issued the new figure early Sunday. She says numerous homes, businesses and other buildings were destroyed by a separate blaze burning in Lake County but that an official count has not yet been released. California Gov. Jerry Brown has declared a state of emergency in Lake and Napa Counties after a wildfire charred more than 60 square miles within 12 hours, prompting thousands to flee their homes. Brown said Sunday the declaration will expedite debris removal and waive fees to people who need to replace official documents lost in the fire. The blaze, about 100 miles north of San Francisco, has destroyed an unconfirmed number of homes and other buildings and damaged highways and other infrastructure. Brown had earlier declared a state of emergency for a separate 101-square-mile wildfire about 70 miles southeast of Sacramento that has destroyed 86 homes. 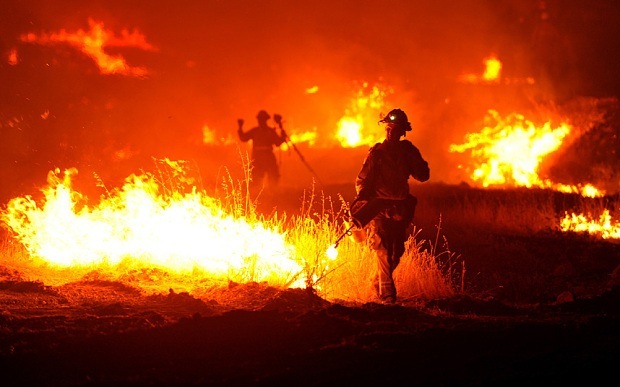 Firefighters have made gains in their efforts to corral a 101-square-mile wildfire about 70 miles southeast of Sacramento, California. More than 4,000 firefighters are working to beat back the flames and crews increased containment to 20 percent by early Sunday. Mandatory evacuations remain in place. The fire, which broke out on Wednesday, destroyed 86 homes, 51 outbuildings and was threatening about 6,400 more. Teams had arrived by Sunday to assess the damage. Authorities say the dry conditions, steep terrain and limited access to the flames are making for a challenging firefight. The destructive wildfire roaring through Northern California’s parched Lake County has surged ahead, churning through an extra 23 square miles overnight. California Department of Forestry and Fire Protection spokesman Daniel Berlant tweeted Sunday morning that the fire has burned up 62 1/2 square miles. Authorities say the fire erupted in Lake County, about 100 miles north of San Francisco, Saturday afternoon and rapidly chewed through brush and trees parched from several years of drought. An unconfirmed number of structures were destroyed. Entire towns as well as residents along a 35-mile stretch of highway were evacuated. Four firefighters suffered second-degree burns in fighting the blaze and are hospitalized in stable condition.